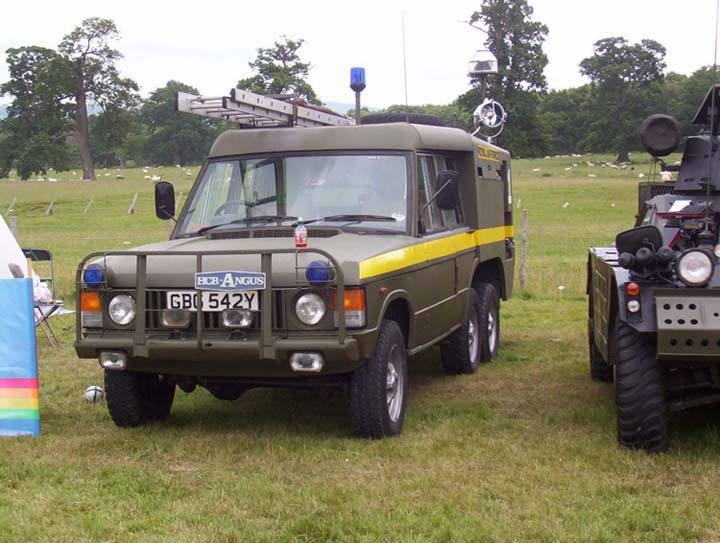 Fire Engines Photos - Range Rover TACR. Truck Airfield Crash Rescue (TACR)an ex RAF vehicle, these Rovers could shift, never drove one but chased one in a V8 Land Rover. Added by Andy Daley on 07 January 2007. Thanks for that Andy worth a visit one day. Added by Andrew Wright on 08 January 2007. This TARC2 has now be re-sprayed Red, which is a shame, as there are not many left in Nato Green now - if any? Added by Barry on 07 August 2007. Added by Walter Davis on 08 August 2007. Added by Mark (Scouse) Watson on 29 April 2009. Nice picture Andrew and unusual to see a "greenie". Its a pity about the respray though, restoration is about presenting it as it was in service, and if it served in West Germany, then green it should be. Added by John Stott on 30 April 2009. Thanks John, who knows another might turn up that has not yet been seen, these things do happen. Pity Walter doesn't take his team up to Llandudno this weekend. Added by Andrew Wright on 30 April 2009. Added by Walter Davis on 01 May 2009. Oh well Andrew never mind its probably too far for him! Age you know! lol! Me, another tractor rally, far slower and less thirsty than a Tac 2! Added by John Stott on 01 May 2009. I have a Range Rover, so have an idea of consumption, and it can sometimes hurt. Pity you can't get to the Anglesey Rally on the 16-17 May, Walter. Added by Andrew Wright on 01 May 2009. Added by John Stott on 02 May 2009. I'd take one on, if only for shows the ouch factor would not have been too bad, I wish I'd known the old Caernarfon machine had been for sale I would have gone for that, sadly I'm skint again now, 4.0L Discovery you see. Added by Andrew Wright on 02 May 2009. 16/17 May eh...I'll look into it Andrew, do I have to book?? Added by Walter Davis on 02 May 2009. Yes or go onto the Anglesey Vintage Society web site. Added by Andrew Wright on 03 May 2009. I drove this TACR 2 in Wildenwrath. I am about to have my red TACR 2 sprayed green. I have a TACR 1 that I have sprayed green. Added by Ashley Wood on 08 June 2017.